Back in 2003, Matt Mullenweg and Mike Little created a fork of b2, which resulted in the open-source, self-hosted content management system, WordPress.org. In 2005, Matt founded the company Automattic, under which WordPress.com, a blogging platform that includes web hosting and domain registration, was launched in that same year. The difference between WordPress.com and WordPress.org is where your site gets its webhosting and domain registration. WordPress.com runs on the open-source version of Wordpress.org. In contrast to WordPress.org, with WordPress.com you don’t need to think about things like hosting, domain registration or the development of your website. Simply create an account, pick a name for your site and you’re ready to go. The free WordPress.com plan allows you to start blogging using a subdomain (e.g. mywebsite.wordpress.com). You don’t have to pay for domain registration or hosting, and you never have to deal with any coding. WordPress.org represents the open-source version of WordPress. Using the open-source version requires you to register a domain name and a hosting plan, usually done with a third-party registrar. Registering a domain name and a hosting plan will cost you money on a yearly basis. After registering a domain name and a hosting plan with one of the many registers, you download the open-source WordPress core from WordPress.org, and install it on your hosting or server. Before looking at which version of WordPress is the best for you, let’s take a look at the costs involved with both versions. 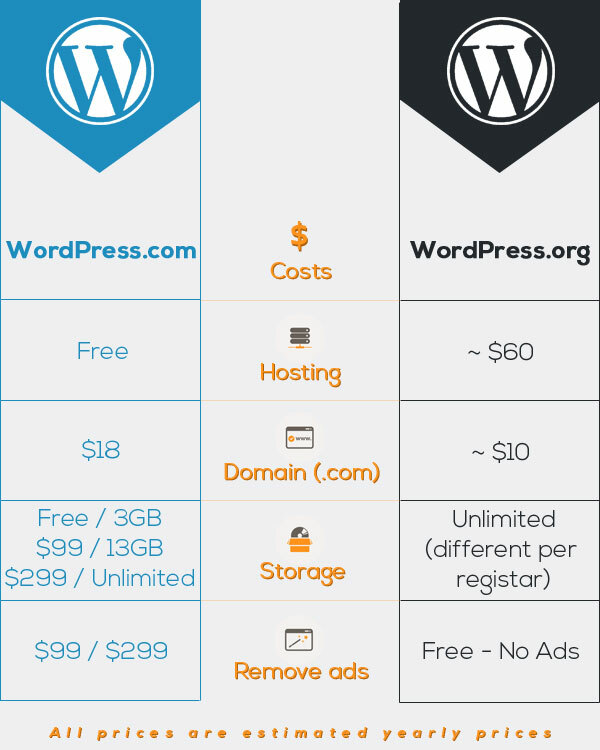 We created an infographic to lay out the differences in pricing between WordPress.com and WordPress.org. If you’re just starting a WordPress.com blog and if you want a custom domain, or if you’re running a free blog with a subdomain and only want to have a custom domain, there is good news. You don’t have to purchase a premium or business package to get a custom domain, you can purchase a custom domain (or add a domain you already own). This is the only upgrade still available. To choose between WordPress.com and WordPress.org, we advise not to look at the different costs. What you need to do is ask yourself if you want to have full control over your WordPress website. If you’re not into coding and just want to start a blog without any hassle, then WordPress.com is the right thing for you. WordPress.com lets you focus on publishing great content and will handle everything else for you. 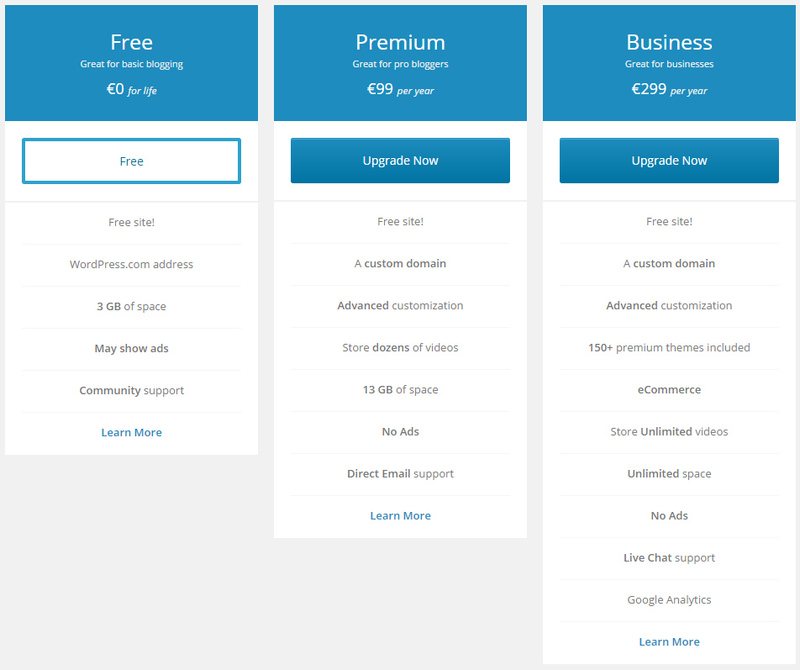 WordPress.com has limits that WordPress.org doesn’t have, for example, the free plan gives you a sub-domain which only has negative aspects (e.g. hard to remember, bad for SEO, et cetera), and has ads included. The payed plans offer a custom domain and a bit more storage space, but although it says ‘advanced customization’, it still limits you in customizing your website like you can with WordPress.org. If you want to have full control over your website and know some coding (or have the funds to hire a company to do the coding for you), then WordPress.org is the right thing for you. WordPress.org allows you to edit the website/theme or upload your own custom WordPress themes, create your own codes and scripts and install plugins and widgets to easily extend your site’s functionality.